In 2010 Roy and Sarah Nyirenda were challenged by the number of deaf children in the community where they live who were being dumped by their parents. They decided to adopt some of these children as their own because they had nowhere else to go. This extended family started off with just a few children but has grown to 45 children in total. They say that every child has a history, some of them have parents that have died, others have parents but they have been thrown away. The vision of Ukusenaminwa Child Foundation is to see the children grow so that they can live independent lives. This involves sending all the children to school so they can get an education. Each Sunday after church they are also involved in providing a meal for many other deaf people in the community. 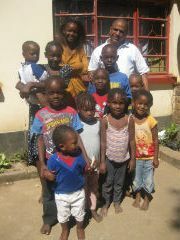 Some of the older children who have been with Roy and Sarah for a number of years have now managed to become self-sustaining in the community. One has a business in the market selling goods, another has a job looking after gardens. In 2016 they even had a deaf couple get married in Grace Church and are renting their own place. Roy and Sarah also own 15 hectares of land in the rural outskirts of Kabwe where they have recently completed building a larger home to house everyone. 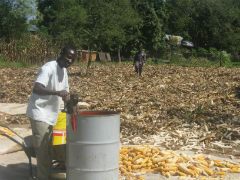 They have learnt Foundations for Farming methods and they have seen some good crops for the household to consume. All the boys living at the farm are involved with the farming. BHW's Zambia Partnership Facilitators met Roy and Sarah in 2009 while they were living in Zambia and since returning to live in New Zealand in 2012 have continued to keep in contact. Originally the Foundation was being regularly financially supported by Grace Church in Kabwe, Zambia but in 2014 we were informed this was no longer happening. Their support no longer had any structure and the funds each week depended on the offering received from the church. In early 2015 a decision was made to commence partnering with Roy and Sarah to assist them in ensuring all the children were able to go to school. The beneficiaries here are the vulnerable children being cared for by Roy and Sarah. There are currently nine children at boarding secondary school, 18 living at home going to day school, five children living with them who are not able to go to school, and eight who are studying further education. 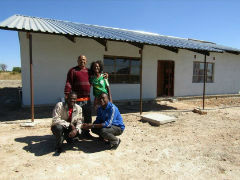 Best of all, five have now left the deaf house and are living in the community. Roy and Sarah have such compassion for the deaf children and have given so much of their own life to helping these children. Roy works for Zesco as a Linesman to provide support for the family. They have taken on the children because they need a place to stay. Roy and Sarah handle all the day to day running and administration and the Board meets whenever they feel that they need some help with direction and encouragement. The vision of Ukusenaminwa Child Foundation is to see the children grow so that they can live independent lives. The current budget here is US$11,440. Of this, $2,640 will be used to run community courses and the rest is for operational costs of the home and to get the secondary children to boarding schools that have the capacity to take deaf children. Knight is 18 years old and is in Grade 9. He first came to the deaf house in 2009, he was the first child that Roy and Sarah took in. Before that he was living with his mother. His mother had written a letter to Grace Church saying her son was actually just a neighbour, and because they were moving they could not take Knight with them. But the truth was she was getting remarried and they just wanted to dump him. Knight actually passed Grade 9 last year, but due to the fact there were no funds to send him off to the secondary school in Lusaka he has stayed in Kabwe and is doing Grade 9 again at Broadway school. He likes staying at the house, and loves to play football as a goal keeper. Each week they play for fun at Lukanga School with some other deaf children. They occasionally manage to arrange to play against other deaf teams from other towns (in fact they beat a team from Lusaka once). 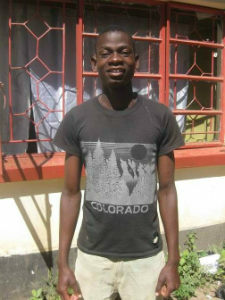 He helps around the house by doing dishes, especially after Sunday lunch, and also earns some money through piece work. When he finishes school he wants to go to Lusaka and be trained in carpentry.